Blogging Meme & Philippines Giveaway! Time for a blogging meme! (Stolen from BPD in OKC). I started this blog March 2008. Before I started this blog I used to have an online journal on Xanga. I wanted a place where I could share & document my long distance relationship's story. The idea started from reading other blogs out there, I wanted to tell my story too. I'm usually logged into my blogger dashboard reading blogs every day for 1-2 hours. When it comes to my own blog, I may spend 3-4 hours a week writing blogs. I used to write stories & poetry and songs a lot when I was younger. I blog mostly about my daily life, my long distance relationship, our immigration process, pets, photography, my trips to the Philippines. I try to keep my topics interesting & unique. Sometimes I like to do features on different places, products, foods, etc. Life, my husband, the future. I post a lot of pictures on my blog, so most of the time the stories write themselves from my pictures. Sometimes when I'm out and something interesting is happening, I'll say, "This is blog worthy!" I try to link and cross reference posts, so people reading can either back track in my blog or click a link for something I'm talking about to get a better understanding. I don't blog about work in depth or co-workers. I go with the flow and whenever I'm inspired I blog. When I'm blogging from the Philippines, I try to update at least once a week. And now in honor of blogging it's time for another giveaway! 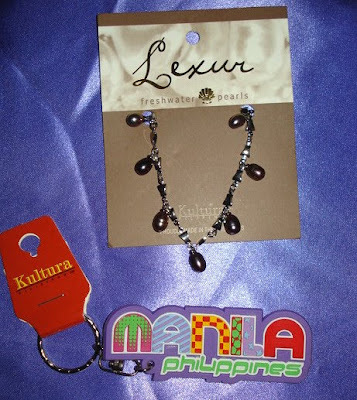 I picked up this gorgeous freshwater pearl bracelet & key chain from Kultura in the Philippines. The pearls on the bracelet are an iridescenct burgundy color. (Kind of reddish/purple.) The chain is silver. It's stunning in person, the picture doesn't do it justice! The rubber keychain says, 'Manila, Philippines'. 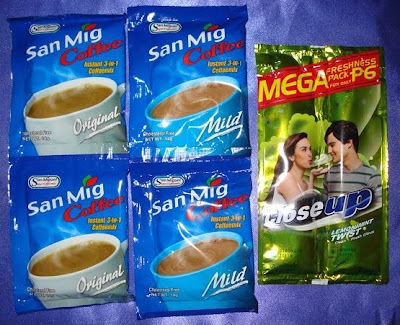 I'm also including 4 packs of San Mig 3-in-1 instant coffee in: Original & Mild. (best instant coffee ever! I always stock up when I'm in the Phil!) and 2 packs of Close Up Lemon Mint Twist Toothpaste! Both Philippines Products! To enter the giveaway leave me a comment telling me how you found my blog & why you enjoy reading it. This giveaway is not restricted to the United States, so my international readers can enter! Family & friends are not excluded from the giveaway. I will use a random number generator to determine the winner! The deadline to enter this giveaway will be: February 22nd, 2010.